and Salem. Until the mid-18th Century, it was the largest town in North America. be borne by the colonists. Accordingly, they imposed a series of taxes on the colonists. The Americans saw the war as greatly increasing the size of the British Empire and thus of benefit to the mother country, not just the American colonies. Furthermore, they resented having taxes imposed upon them by a government in which they had no elected representatives. In Boston, this resentment led to protests led by Samuel Adams and John Hancock and the formation of groups such as the Sons of Liberty. The British government became so concerned about the atmosphere in Boston that it sent troops to Boston. On March 5, 1770, a detachment of soldiers fired into a crowd that had been taunting and throwing stones at them. Five people were killed and depictions of the Boston Massacre were distributed throughout the American colonies helping to turn public opinion against the British government. Parliament responded by repealing the taxes except for the tax on tea in order to show that it still had the right to tax the Americans. This in turn led to further American protests asserting “no taxation without representation.” In Boston, about 130 men, some disguised as Mohawk Indians, boarded three ships and dumped 342 chests of tea into the harbor in the Boston Tea Party of December 16, 1773.. Angered by the destruction of this valuable cargo, the British government closed the port of Boston. Tensions continued at a high level until March 1775 when British authorities decided to arrest Samuel Adams and John Hancock and to confiscate gunpowder and arms that the Americans were storing at Concord. 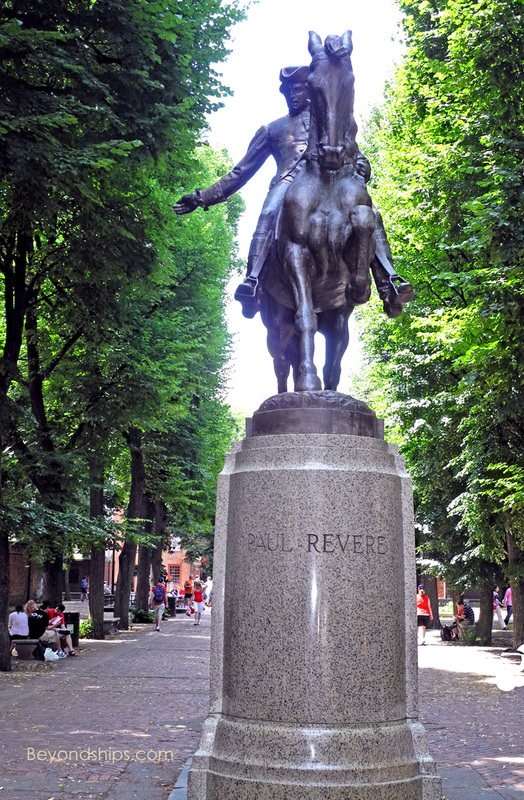 Warned by Paul Revere and others that British troops were coming, American militia (the Minutemen) confronted British regulars at Lexington in the first battle of the American War for Independence. 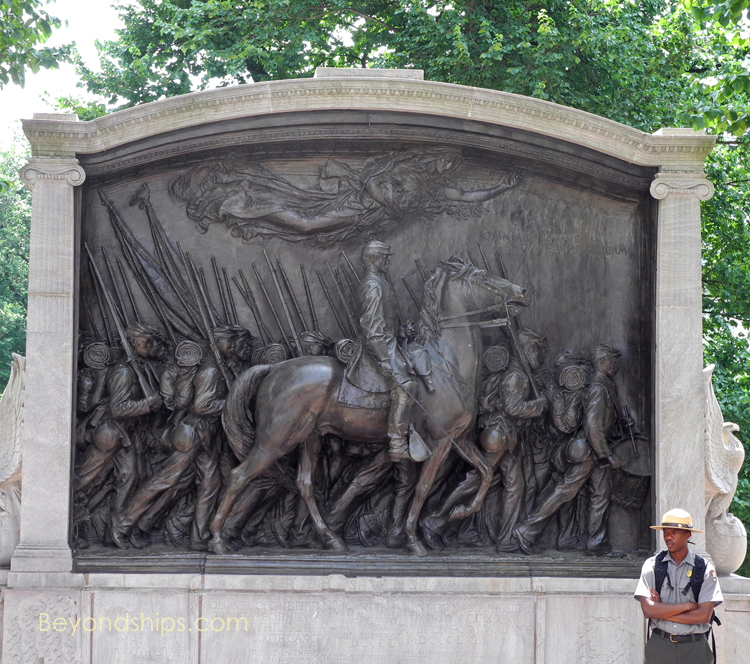 Following the battles of Lexington and Concord, American militia from throughout the 13 colonies surrounded Boston. The British attempted to lift the siege by attacking American positions in neighboring Charlestown in the Battle of Bunker Hill. Although the British eventually took the positions, they suffered very heavy losses and were not able to break the siege. Since the British were able to re-supply by sea, the siege became a stalemate. The Americans, now under the command of George Washington, eventually secured artillery pieces, which rendered the British position in Boston untenable. Consequently, the British forces and their Loyalist sympathizers were evacuated by sea. Washington entered the city in the first major American victory of the war. leading to the Old North Church is a Boston landmark. 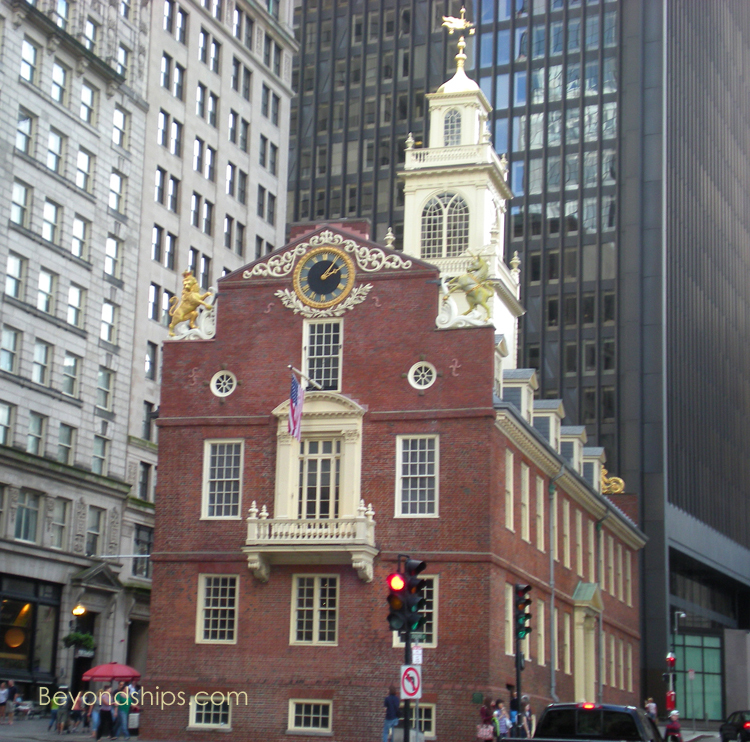 Below: The Boston Massacre took place near the Old State House where a few years later the Declaration of Independence was read to the public. Victorian Old City Hall. 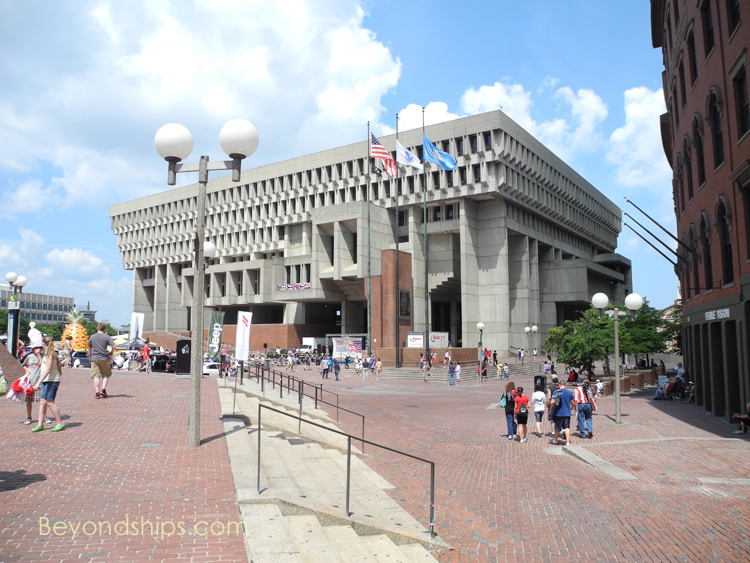 Below: The City Hall of today. Holmes senior, Ralph Waldo Emerson and others living and working in the Greater Boston area. legal minds, practiced law in Boston. The Great Depression of the 1930s hit Boston hard. underwent a physical transformation in a project known as the “Big Dig” that placed an elevated highway that divided the downtown area underground creating a wide green space. Meanwhile, numerous tall buildings were being erected giving Boston a skyline second only to New York on the US East Coast.